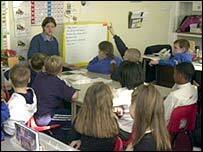 Parents in Grimsby are to stage a protest march through the town over plans to close primary schools. Councillors say up to five schools must close to reduce 3,500 surplus places - a figure which could rise to 4,500 by 2009 unless action is taken. Elliston and Bursar in Cleethorpes, and Littlecoates in Grimsby, are earmarked for closure. Eastfield and Ravendale in Immingham are also under threat. Parents from Elliston School will march to Grimsby Town Hall on Monday. Mothers and fathers in Cleethorpes have already held two marches and picketed general election polling stations on 5 May. North East Lincolnshire Council says it is consulting parents and school staff and wants to hear all views.